Delicious and festive mint-chocolate cookies — like a mint brownie but in cookie form! The chocolate-cookie base is made with a brownie mix for an authentic brownie-tasting cookie. Well it’s official. Little Grey made his very first recipe ever yesterday. He’s only two and cranking out recipes. Amazing right?! I almost photographed his creation and shared the recipe here the blog, but the smell alone was enough to convince me that not a soul would ever want to replicate his creation. 3 packages strawberry jell-o mix (again do not prepare as directed.) Oh, and one was sugar free. Also, some crushed up pretzels to top it off. (An optional garnish). Directions: Open the dishwasher that is filled with dirty dishes. Remove a mixing bowl, spatula, and whisk. The great news is, this recipe is SUPER quick to prepare. Let’s just say it can be made faster than a nursing mama can feed her other babe while her toddler is removing all of the contents of the bottom shelf of the pantry and mixing them together. Why I keep (KEPT, now) spices on the bottom shelf of my pantry was to re-fill the ones in my spice rack once they are empty. Yes, I have (had) a lot of spices before the little guy got into them all. Or most of them haha. The funny part of this whole thing was, I was in the room right next to the kitchen on the couch feeding little Bentley. The counter blocks my view of the actual pantry and part of the kitchen so I heard little Grey playing around in there, BUT I was certain the pantry was closed. And if the pantry is closed, it also happens to have a child lock device so I was certain he couldn’t be getting into anything too serious. But recipe creation would not be interfered with. The pantry was, in fact, not closed and he managed to create that beautiful recipe I just shared. Okay beautiful may be a major exaggeration. It smelt disgusting. Anyways, since I couldn’t very well just share his less than appetizing meal (side dish? dessert? death wish?) 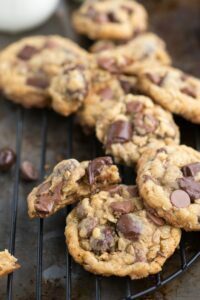 with you all, I’ve got some super delicious cookies instead. I’ve actually been working on making the PERFECT mint brownies for a couple of months now. I’ve made tons of batches and they are just about there. In the midst of making all these mint brownies (and taking them to give out at just about every single place I go), I had the idea to turn the recipe of mint brownies into a cookie. These cookies are a very similar recipe to the mint brownies I will be sharing soon-ish, but they taste totally different by being in a cookie form. The husband said he likes these best. They are such a fun cookie and would be the perfect addition to any cookie exchange! 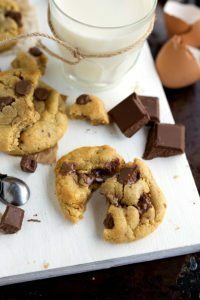 A super soft and chewy chocolate cookie topped with airy frosting and a slightly crunchy chocolate topping. They are divine! In a large bowl, cream together the cream cheese and butter until completely smooth. 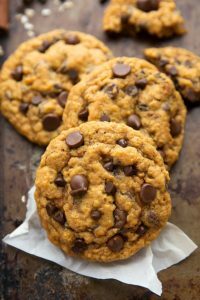 They must both be at room temperature -- do not melt or soften in the microwave of your cookies will flatten more/ be less thick. Just leave out for about 45 minutes to an hour and they'll be perfect! Beat in the pudding mix (do not prepare), and flour. Stir in the andes mint chips and milk chocolate chips. Scoop out cookies using a cookie scoop onto a baking sheet lined with parchment or a silpat liner. Bake for 13-16 minutes. Slightly under-baking these cookies gives them an awesome taste and texture like ultra fudge-y brownies so err on the side of slightly under-baking. While the cookies are baking and then cooling, prepare the frosting. Beat together the cream cheese and butter. Again, at room temperature and not softened. Beat in the peppermint extract and green food coloring (optional). Slowly add in the powdered sugar and beat to combine. It's, again, super thick, but keep beating and it will come together. Don't add any milk or it will be too soft. Scoop out frosting and smooth over the top of the completely cooled cookies. Freeze the cookies for 5-10 minutes. In a microwave safe bowl, combine the andes chips and the butter. Microwave in bursts of 15 seconds stirring in between each burst until the chocolate is completely melted and smooth. Dip the cookie into the melted mint chocolate using a spoon to even it over the frosting. Allow to set and the chocolate to harden. *It is very important you get the right sized brownie mix (18.3 ounces) otherwise these cookies will likely be too wet/dry/not work out! Chocolate brownie cookie base adapted from my Mint Chocolate Brownie Cookies. Chelsea, Omagaahhhh! How incredibly delish are these! Oh, and love the video too!!! I love chocolate and mint combination so much! These were already perfect and then you went and added even MORE chocolate overtop the mint [heart eye emoji]. I would gladly accept all of these at a cookie exchange. 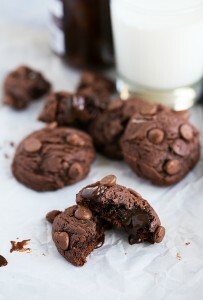 OOMG yum who wouldn’t want these brownie cookies! LOVING the photography!! Is that a new plate? =) Very nice! Maybe just maybe Grayson will need a little help next time in the kitchen, but I love that he’s experimentING and creating on his own even if the result was gross. Haha! But these cookies look divine! I just love mint brownies, and these sound even better! No but really, I’ll take a few of these cookies!! omigosh! Grey’s a little chef! lol you poor thing! Aw, I love all the stories about kids! Mine are not so little anymore 12. 10, and 8 and their stories aren’t quite as cute as they used to be. These brownies look delicious. Love the video! Haha thank you so much Karen! 🙂 You are so sweet! Haha aaw Grey is too cute 🙂 Hopefully he didn’t ask you to try any of it?? These cookies on the other hand look absolutely incredible! Love anything chocolate and mint! Oh my gosh, I love Grey’s recipe! But (don’t tell) I think I like yours a little better. 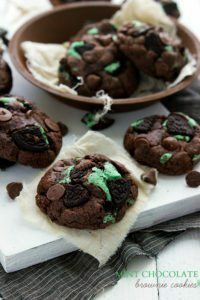 Brownie cookies sound amazing and I bet that mint frosting is soo delicious! Must try soon! Hi Chelsea. I just found your blog recently and I love all of your recipes. There are so many that I want to try. 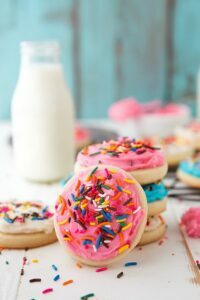 These cookies look amazing. I make a similar brownie-ish cookie, then put an Andes candy on top of the hot cookie and let it melt. It makes a great frosting. I also wanted to say how much I enjoy your videos. Very fun. Grey sounds like he will be a creative baker someday, with a little direction. Hee hee.